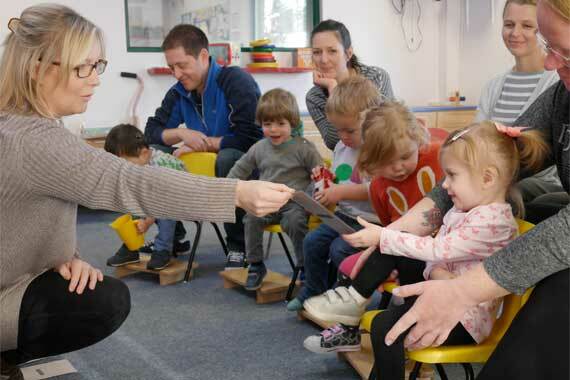 At our Hampshire Family Centre we provide nursery services for young deaf children from 18 months of age to around 2½ years of age, at which point they move on to our preschool classes. Our toddler classes last for three hours - parents attend the classes once or twice a week with their children. 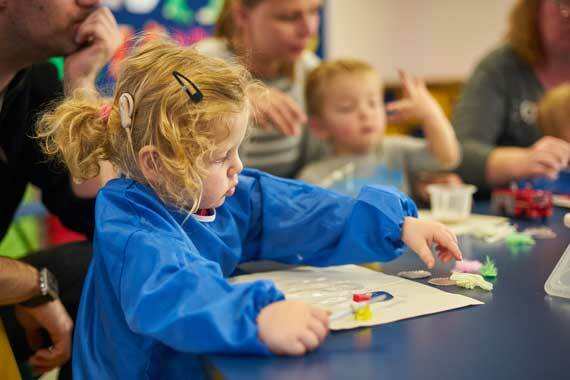 Through these services we aim to engage and stimulate deaf children throughout their earliest years, helping nurture strong listening skills that will equip them in their journey to developing speech and language. "We were welcomed with open arms into a centre which was to take my fear away, and achieve with my son what I feared for him was unachievable." We believe that one of the most important aspects of our toddler classes is the support that parents give to each other. During their time attending our toddler nursery parents and children form relationships and friendships with each other which often last for many years. Our teaching team plans the lesson content carefully, ensuring that the our toddler classes' curriculum follows the objectives of the Department for Education's Early years foundation stage statutory framework (EYFS) that sets out the standards that school and childcare providers must meet for the learning, development and care of children from birth to 5 years of age. 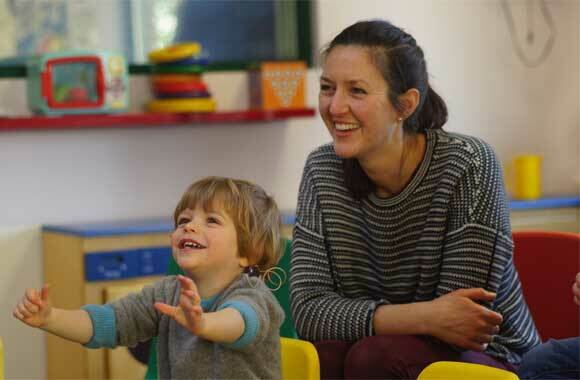 The toddler classes encompass a wide range of activities that aim to engage and help stimulate the children's residual hearing to help nurture strong listening skills and to foster early communication skills that will equip them in their journey to developing speech and language. We also aim to help parents know how to keep their toddler's hearing technology working effectively on a day-to-day basis, so their child can access the fullest possible range of sound frequencies. We offer each child access to a service provided by our Specialist Speech and Language Therapists (SALTs). This service is currently funded by a grant from BBC Children in Need. One of our Therapists will see children who require extra input for one-to-one or small group therapy sessions on a regular basis, and will give practical demonstrations so parents can provide further language-learning opportunities at home. 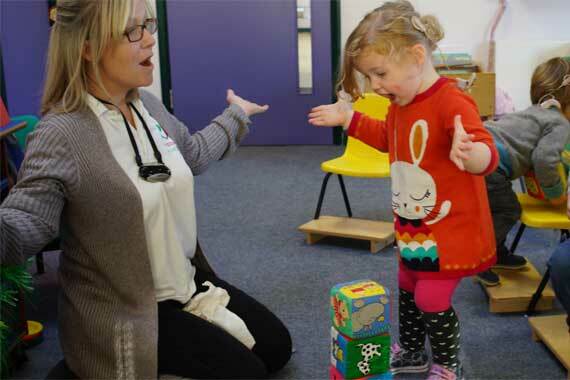 Our Therapists work closely with parents and their colleagues on our Education team to monitor and develop the children's receptive and expressive language skills (what they can understand and what they can say), their social skills and their speech clarity. With parental permission, our Therapists will also liaise with other professionals working with the child to ensure the best outcomes and to facilitate a smooth transition to primary school. 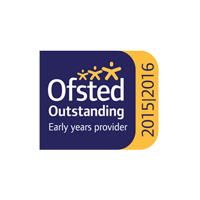 We regularly assess, with the parents, each child’s early listening skills and their nonverbal and verbal communication skills. These assessments form the basis of regular Individual Education Plans that target specific language and listening skills for development. In addition, every toddler has the opportunity of individual sessions to help support and consolidate the work done in the nursery environment and develop listening and related language skills. We currently request a parental contribution of £6 per toddler session. The Elizabeth Foundation is a registered charity and we rely on income from a range of sources to support as many deaf children and their families as possible, wherever they live. In order to ensure that our Education service is sustainable in the long term, we ask for a sessional contribution fee for this service and rely on this to maintain the outstanding services that we provide. However, we have done everything we can to keep these fees as low as possible and they do not cover the full cost of providing this specialist service for preschool deaf children which we subsidise using other sources of charitable income. You can pay for the fees in a variety of ways, including using Early Years Funding or Childcare Vouchers / Tax-Free Childcare. If you are experiencing financial difficulty and feel that you will be unable to pay these fees please let us know. If you have a deaf child aged from 18 months old to 2½ years and would like to join our toddler classes, please contact us.